If you haven’t seen what’s happening in 3-D printing, you will, because it is evolving from labs and hobbies to useful. Most of the work has been in either very high-tech and expensive applications (printing jet engines) or home-printed bits of art and whimsy (your own bust of Yoda or Einstein.) One set of innovators have figured out how to print in steel, a drop at a time, building up from a dot, without the need for a printer. They have already printed small, demonstration bridges, frameworks, and art (of course). Their main demonstration project will be to print a full-sized pedestrian bridge in place over a canal. 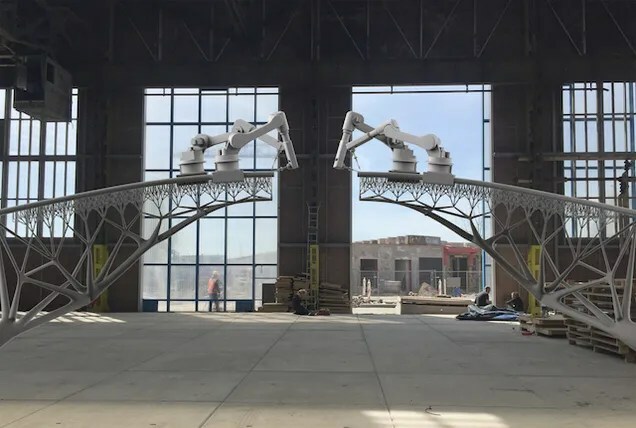 If the technology eventually succeeds, it should be able to print bridges where it is too dangerous for humans to work, print buildings in shapes architects never could attempt before, and undoubtedly create new businesses. Our infrastructure may provide sufficient incentive.